Gilt Group! In San Francisco? 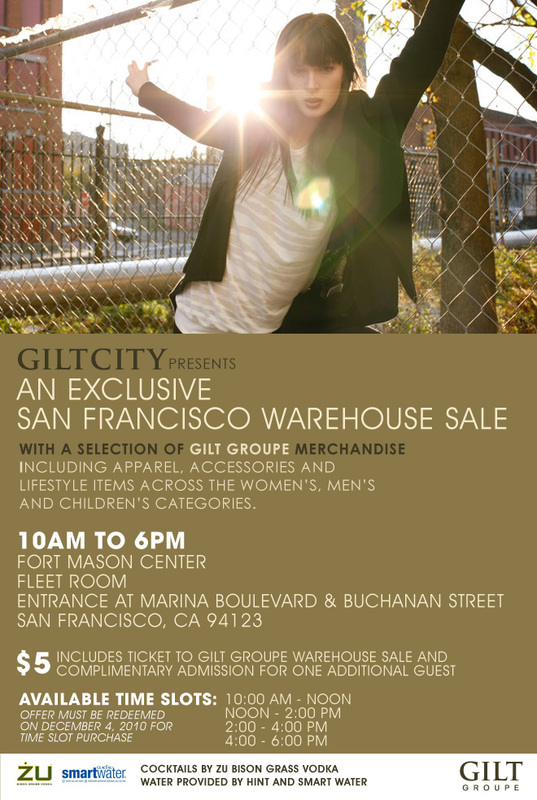 Gilt City SF hosts a special one-day only pop-up sale on December 4th. 10AM - 6PM at Fort Mason Center, in the Fleet Room. $5 includes Ticket to Gilt Group Warehouse Sale +PLUS+ Complimentary Admission for One Additional Guest! Get ready for cocktails and shopping up to 75% off on apparel, accessories, and home from such celebrated lines as Alexander Wang, Marc Jacobs, Kelly Wearstler, John Varvatos, Hugo Boss, Hickey Freeman and more! !